to meet with the Astronerds (their word, not mine) while they split open the dome to let us see the sky through the telescope. We were there — we didn’t miss the night — but we mist the view. It was cloudy. Again. Everytime we have ever gone there… it is cloudy. 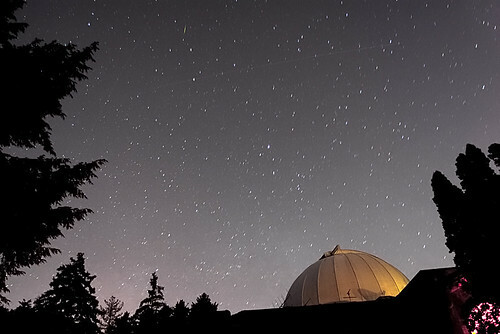 There is so much to say about this place — tucked away off a busy highway, far above the city, that never dreamed surbubria would encroach so deeply into its space with all of its light pollution — poaching out the vibrancy of the stars. When you walk through the doors of this building, you know something is different. It’s quiet — but it’s underneath all the other noises in that building. It’s quiet… like walking into a church. There is a hush — although you can’t hear the hush… but it’s there… where did it come from? As if all that oak in the building has transformed the space into a quiet forest. It’s certainly not the astronomers who are quiet. They’re nuttty and loud and so excited to show you their spheres, orbs and constellations. We listened to the talk… cleverly and artfully designed for kids. Isn’t it magnificent to watch someone so knowledgeable, and so professional take his story down to the level of a child? You can’t help but wonder from what place his words come from — a heart that is still amazed, that is still in awe over the wonder of the falling star — and who is all too eager to share what he knows. He told us that when he was about 10 years old, he sat outside with his father’s opera glasses, and watched Jupiter’s moons move — he sat there for hours. When he was ten. He sat still for hours and just sat in amazement at those moons. He is still ten. In his heart. The same wide-eyed wonder of a little boy. Sadly, again, we could not look out of the telescope. But he did tell us about Venus — how there is so much pressure there that it would crush you, and the temperature is 900 degrees, (want to know what would happen to you if you were in 900 degrees? Put a chicken in the oven, and turn up the heat to 500 and watch.) And it always rains there — sulphuric acid rain. Who knew Venus was so inhospitable? The Russians sent a spaceship there — it lasted 20 minutes before the atmosphere destroyed the ship. But they were proud of the pictures they got in those 20 minutes. He also warned us, that on the next clear night, to take our kids outside to see this — or he would come to our house and do something terrible to us. I’m warning you now, to get outside and see this for yourself. Here it is: The Three brightest objects in the sky form a perfectly straight line in the western sky. The moon, Jupiter and Venus, for the Moon-Jupiter-Venus Conjunction. 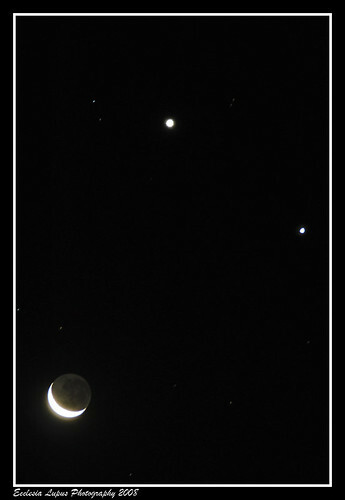 I could not take a picture of this — I am not that skilled — so I went to Flickr and found this — when the Moon, Jupiter and Venus formed a triangle — in 2008 — in Australia! So, Carolyn… right now we’re looking at the same sky! You can see this in the city!!! We saw it tonight. And I had forgotten about it — but my husband and I went outside to take a walk, and there they were — all lined up… one powerful straight line… and I remembered… and we called the boys out to see it — because I do not need that Astronerd coming so my house. They are so bright, nothing can hide their power. Everywhere. And, from what I’ve read, Jupiter and Venus will keep moving closer until the middle of March. Our littlest son got it — “It’s really rare to see those lined up in a straight line like that.” Wow… nothing like watching moons for hours… but he got it. Isn’t it funny that a God who is timeless actually created time. 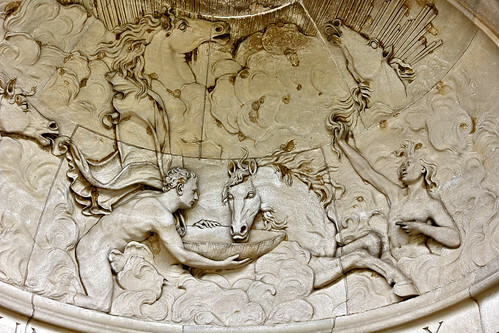 He used those majestic celestial orbs that we gaze at to give us some way to grasp time… to quantify time. A moon gives us our month. We can completely understand that… or can we? That little use of the word “separate” just gives me a window into the character of our great creator. Separate. Can you imagine being so vast that you can order day and night into categories? He simply puts a divider into His filing cabinet to separate the two — day and night. Just with a little file divider? It’s that simple for Him. And yet, He doesn’t even need to call it day and night — knowing that we, in our minds, need a day and a night. and a moon, — because we cannot grasp timelessness. And we need something to separate light from darkness. That concept, alone, is just as vast and mind-boggling as pondering how all of those celestial beings keep moving, like clockwork, and not one of them falls out of line or misses a step. And, how much we count of those beings to do their part. We count on them. We know exactly what time the sun is going to come up, before it does… and it never fails us. Fruit Flies Used In Human Genetic Research? Wow! So excited to see that alignment! was it that long ago? I remember shooting it myself off our balcony. It reminds me of that song from An American Tail……. What a beautiful post Susie.